Recently, a patron sent us an email alerting us to a slew of criticisms that Fr. Paul Kramer posted on his Facebook account regarding our book True or False Pope?, and a number of theological positions that it sets forth. The patron emailed us screen shots of Fr. Kramer’s statements against the book. As many know, Fr. Kramer is a priest who publicly declares, on his own authority, that Pope Francis is an antipope, which is contrary to the current public judgment of the Church. Mr. Salza was particularly disappointed in learning of these somewhat clandestine criticisms, since he has enjoyed an amicable relationship with Fr. Kramer over the years and has also endorsed some of his work. What was most disappointing was that Fr. 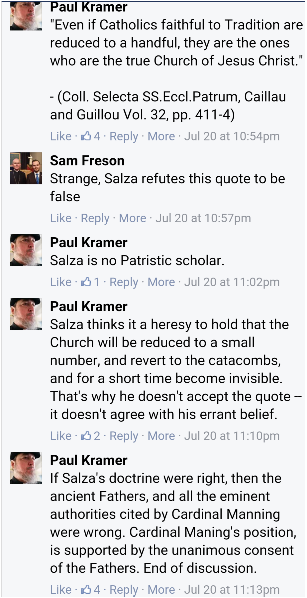 Kramer, quite falsely, criticized a point of Salza’s scholarship when, as you will see, it is actually Fr. Kramer’s scholarship that is lacking, especially in regard to the theology concerning a heretical Pope. With due respect for Fr. Kramer, we believe it is necessary to directly address the many errors he posted on his Facebook page, which even some of his “friends” attempted to correct, but to no avail. In this series of articles, we will provide the relevant posts from Fr. Kramer’s Facebook page, followed by our replies to his posts. Fr. Kramer (cites the following alleged quotation from St. Athanasius): “Even if Catholics faithful to Tradition are reduced to a handful, they are the ones that are the true Church of Christ. Posted July 20, 2016 at 10.54pm. “Deus quidem vos consoletur, novi autem quia non hoc solum vos contristat; sed contristat et illud, quia Ecclesias quidem alii per violentiam tenuerunt, vos autem interim foris estis a locis illi enim loca, vos vero habetis apostolicam fidem. Illi in locis existentes, a vera fide sunt foris: vos vero a locis quidem foris estis , fides vero intus. Discutiamus quid sit majus, locus an fides. claret utique quia vera fides. Quis ergo amplius perdidit, vel quis amplius habet, qui locum tenet, an qui fidem? Bonus quidem locus est, quando illic apostolica fides praedicatur: sanctus est, si ibi habitat sanctus. Et post pauca: Vos autem beati, qui fide in Ecclesia estis, in fidei fundamentis habitatis, et sufficientem satisfactionem habetis, fidei summitatem, quse in vobis permanet inconcussa, ex apostolica enim traditione pervenit ad vos, et frequenter eam execranda invidia voluit commovere, nec valuit: magis autem per ea quae commoverunt sunt abscissi. Hoc est enim quod scriptum est: « Tu es Filius Dei vivi » Petro per revelationem Patris confesso, et audiente: « Beatus es Simon Barjona , quia caro et sanguis non revelavit tibi, sed Pater meus qui in coelis est, » et caetera. Nemo igitur unquam vestrae fidei praevalebit, dilectissimi fratres: si enim aliquando Ecclesias reddiderit Deus, credimus enim hoc, verum tamen ne tanta Ecclesiarum redditionem sufficit nobis fides. If one consults a popular online version of the letter of St. Athanasius to his flock, the fraudulent sentence is added at the end and replaces the sentence in bold. What this shows is that Fr. Kramer simply pulled the quotation from an internet source without checking the reference to see if it was authentic. Had he read True or False Pope?, he would have learned, from footnote 59, located on page 35, that the quotation is absent from the Collectio Selecta. In fact, we even provide an online reference to the book so the reader can check for himself. Had Fr. Kramer read our book (which is he publicly criticizing), he would have seen this, and also learned that the alleged quotation does not appear in the popular The Nicean and Post-Nicean Fathers by Philip Schaff (1892); nor is it found in Patrologiae Cursus Completus, Vol. XXVI, p. 1190 (1887). The reason the “quote” is theologically erroneous is because if the Church were reduced to only a handful, it would violate the Church’s perpetual mark of catholicity, as we will further discuss below. Fr. 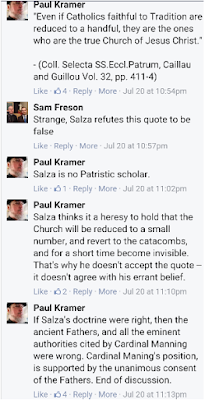 Kramer: “Salza is no Patristic scholar.” Posted July 20, 2016 at 11.02pm. Salza/Siscoe: Of course, one does not need to be a “Patristic scholar” to verify if a particular quotation is included in the document cited as the source. And cutting and pasting quotations from sources on the internet without checking them, as did Fr. Kramer, is certainly not genuine scholarship. We might also add that Mr. Salza has done some noteworthy scholarship on the Church Fathers, and thus Fr. Kramer’s gratuitous comment is not warranted. Salza spent years studying and putting together one of the most comprehensive compilations of quotes (over 800 of them) from the Church Fathers on his website www.johnsalza.com, and his book The Biblical Basis for Tradition – Why Catholics Don’t Rely on Scripture Alone includes one of the more thorough topical presentations from the Fathers in modern apologetics works (a book which has received public endorsements by a wide range of Catholic scholars). Fr. Kramer: “Salza thinks it is a heresy to hold that the Church will be reduced to a small number, and revert to the catacombs, and for a short time become invisible. That’s why he doesn’t accept the quote – because it doesn’t agree with his errant belief.” Posted July 20, 2016 at 11.10pm. Salza/Siscoe: Fr. Kramer’s errors continue. The reason we reject the “quote” is not because it conflicts with our belief, but rather because it conflicts with the Church’s doctrine on moral catholicity, in addition to being completely absent from the source document cited by Fr. Kramer himself. By embracing the spurious quote, Fr. Kramer errs by denying an essential aspect of the mark of "catholicity." In expounding on this mark of the Church, Van Noort explains that it requires that the Church consists “of a great number of people,” “a great number of men from many different nations,” and a “really large number of adherents.” He further says that this “moral catholicity” is a “quality belonging to Christ’s Church perpetually and necessarily.” If the Church were reduced to only a handful of scattered believers, it would lose the mark of catholicity (universality), and therefore would no longer possess the four marks that the true Church must always possess. Furthermore, because the marks are those things which render the Church formally visible, the loss of a single one of them would result in the loss of her attribute of “visibility,” which is also a perpetual quality of the true Church of Christ. Hence, Fr. Kramer’s error, which he justifies by appealing to a fraudulent “quote,” opens the door to many other errors. This error of Fr. Kramer can be seen when he claims that the Church “will be reduced to a small number,” and then claims that the Church will “revert to the catacombs” and become “invisible.” Fr. Kramer fails to make the distinction between these two very different claims. The Church may indeed “revert to the catacombs” and become “invisible” to the outside world for a time (as it was during the first three centuries), but this does not mean that she will lose her attribute of visibility, or her mark of catholicity, which is precisely what would happen if it were reduced “to a small number” of faithful. As Van Noort explained above, the mark of catholicity (i.e., universality) requires "moral catholicity" (i.e., large numbers of people) which is a perpetual quality of the true Church. The true Church is not simply a scattered group of “true believers,” but a visible hierarchical society, consisting of a Pope, bishops and large numbers of faithful. Fr. Kramer errs by confusing the predictions of an underground Church during the end times, with a farcical reduction of the number of faithful to only a handful, and ends by denying the mark of catholicity. Fr. Kramer: “If Salza’s doctrine were right, then the ancient Fathers, and all the eminent authorities cited by Cardinal Manning, were wrong. Cardinal Manning’s position is supported by a unanimous consent of the Fathers. End of discussion.” Posted July 20, 2016 at 11.13pm. Salza/Siscoe: Unfortunately for Fr. Kramer, it’s not “Salza’s doctrine,” but the doctrine of the majority of the classical Catholic theologians. We also note that Fr. Kramer did not explain how “Salza’s doctrine” is in contradiction with “the unanimous consent of the fathers.” He simply made a baseless assertion that he backed up with nothing. Ludwig Van Ott – an authority that Fr. Kramer no doubt holds in high esteem – affirms that the doctrine of moral catholicity (which Fr. Kramer calls “Salza’s doctrine”) is “the established view of the majority of theologians.” It is defined as the Church’s extension “over the whole earth simultaneously” with “a great number of … faithful.” It is a quality that will be “perpetuated,” since it is “a characteristic of the true Church of Christ,”  over which the gates of hell shall not prevail – even during the end times. In fact, Ott says that the doctrine is de fide. Clearly, moral catholicity is not a doctrine that was invented by the authors of True or False Pope? as Fr. Kramer would have his Facebook fans believe. And it is also worth noting, as we explain in Chapter 1 of True or False Pope?, the loss of faith at the end times, alluded to by Christ (Luke 18:18) and St. Paul (2 Thes. 2:3) does not contradict the teaching that the visible Church will always possess a large number of members. Again, the problem with Fr. Kramer’s position is that he conflates an underground Church (which the Fathers predicted during the end times) with a Church consisting of only few members (which is incompatible with the mark of catholicity). Cardinal Manning, to whom Kramer fallaciously appeals, did not make this error. When Manning said the Church would be “invisible” for a time, he was explaining that the Church – the visible social unit with all four marks in tact – would not be visible to the secular world for a time while she went “underground”; not that the Church would lose her attribute of visibility, which is precisely what would happen if it were reduced to very few members (since it would thereby lose the perpetual mark of catholicity, which is one of the marks by which the true Church is known (i.e. is formally visible). Cardinal was most certainly not arguing that the Church would lose her mark of catholicity, nor any of her other perpetual qualities that render her formally visible, even if forced underground. Fr. Kramer: “NO! The visible entity will be APOSTATE. The true Church will be a remnant in hiding. The Church will be briefly INVISIBLE, as the Fathers teach.” Posted July 21, 2016 at 4.05am. Salza/Siscoe: By claiming that the “visible entity” will become “apostate,” Fr. Kramer, in a single sentence, has just publicly denied the indefectibility of the Church, which is another of the perpetual attributes of the true Church! This is not a minor error. As we explain at length in the first two chapters of our book, the true Church of Christ is not “an invisible Church of true believers known to God alone” (which is a Protestant heresy), but rather a visible hierarchical entity – a visible social unit - with perpetual marks and attributes. It is to this visible society, as such (or, in Fr. Kramer’s words, the “visible entity”), that the promises of Christ apply – “the gates of hell shall not prevail,” etc. If the visible Church (or “visible entity”) were to become “apostate,” however “briefly,” then the Church would defect by losing her attributes, and thus the gates of hell would prevail against her. The problem with Fr. 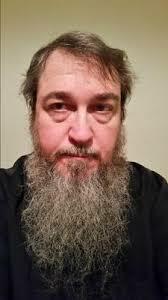 Kramer’s opinion is that he divorces the “visible entity” (which he says will become “apostate”) from the “remnant Church in hiding,” which he says is the “true Church.” Not so, Fr. Kramer. Christ’s promises (e.g., "the gates of hell shall not prevail") apply to the visible Church itself and not to a “remnant” or “handful” of true believers, which is actually the Protestant definition of “indefectibility,” as we demonstrate in Chapter 1 of True or False Pope?. Like the members of the Sedevacantist sect, who fail to see the marks and attributes of the true Church in the suffering Church of our times, Fr. Kramer denies that the marks and attributes will continue to exist in the underground Church during the end times. By claiming that the Church in the days of the Antichrist will become an “invisible Church” consisting of a mere “handful” of true believers, Fr. Kramer not only denies the doctrine of moral catholicity but has embraced the heretical Protestant definition of the Church (i.e., “an invisible Church of true believers”). It is quite sad to see Fr. Kramer now publicly professing Protestant errors in the name of Catholicism. To his facebook friends we say, Caveat Emptor! This error of Fr. Kramer has now spread to some his associates as well (some of whom are also now spreading it). For example, one of his disciples recorded a radio interview with John Salza on the topic of Sedevacantism, but refused to air the program since Mr. Salza explained and defended the traditional doctrine of moral catholicity, which is irreconcilable with his position. What this shows is that there are many today who like to call themselves “Traditional Catholics,” yet whose doctrinal positions depart from traditional Catholic theology. See Christ’s Church, pp. 144-147, cited in True or False Pope? on pp. 49-50. “Christ established the Church as a hierarchical society … This thesis is historically certain, it is theologically de fide” (Tanquery, Dogmatic Theology, Vol I. p. 107). Ott, Fundamentals of Catholic Dogma, Fourth Edition, May 1960 (Rockford, Illinois: TAN Books and Publishers, 1974), pp. 306-307. “Once one proves that the one and only Church which Christ founded is visible from its very nature, then it necessarily follows: (a) that an invisible Church such as that to which Protestants appeal is a pure fiction, and (b) that all the promises which Christ made to His Church refer to a visible Church” (Van Noort, Christ’s Church, p. 13).